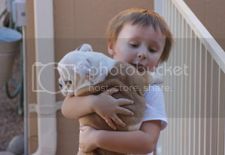 English Bulldog News Forums - July 2012 Kids & Bullies Photo Contest Winners! July 2012 Kids & Bullies Photo Contest Winners! Congratulations to Aldo4ever (acarabias), the winner of our Kids & Bullies contest! Congratulations to desertskybulldogs for being Runner-Up! Congrats to the winners and thanx to everyone that participated. Fun pix and very hard to vote on because there were soooooo many good ones. Yay! First time I made it to the finals!! I am very excited! Ana, your picture is gorgeous and very deserving of the win! Loved all the pics this month was a very fun one to vote on. But ooooooh so tough!!!! wahoo congratulations! I love the winners photo and your was so cute with that wrinkly pup! 2 great pictures!!! Congrats to both of you!!! Two very deserving winners! Congratulations to you both! Very precious photos! Love both of them, actually MANY of them, was a tough one. haha CONGRATS!!!!!! Congrats to all .... the pictures were all awesome. Congrats to the winners, very hard to vote on, so many good ones.